The Supreme Court’s decision does not change the importance of EPA’s role in protecting our families and communities from toxic air pollution. The Court gave EPA the ability to finalize these critical public health protections once and for all. This morning in a 5–4 decision, the U.S. Supreme Court remanded the first-ever national limits on mercury and other toxic air pollution spewed by power plants. The rules will save between 4,000 and 11,000 lives each year by substantially reducing pollution from the dirtiest plants. Although EPA demonstrated that the health and environmental benefits of the standards far outweigh the costs to the industry, the Court found EPA should have considered industry’s costs earlier in the process, when it determined whether these emissions were worth controlling at all. The Court left the standards in place pending further consideration by the U.S. Court of Appeals for the D.C. Circuit and the EPA. The majority of power plants are already in compliance with the standards, having met them without reported difficulty since April of this year. Because EPA has already evaluated the costs and benefits of the rule, the agency should be able to provide the cost analysis required by the Court in short order. Power plants are far and away the worst industrial polluters. Controlling toxic emissions is both technologically and economically feasible. The resulting pollution reductions will yield between $37 billion and $90 billion in health benefits every year. The public will receive $3–$9 in health benefits for every $1 that the protections cost the power industry. One in 20 Americans is killed by air pollution, and coal-fired power plants are a big part of the problem. These plants are also the largest industrial source of toxic air pollution by far, responsible for 50 percent of total U.S. emissions of mercury, a potent neurotoxin particularly dangerous to children. Nearly 7 percent of all U.S. women of childbearing age—more than 4 million women—are exposed to mercury at levels harmful for fetal brain development. The standards will reduce mercury pollution from coal-fired power plants by 75 percent. Earthjustice, on behalf of Sierra Club, Clean Air Council, Chesapeake Bay Foundation and the NAACP, helped defend these health safeguards as respondent-intervenors. "The Council is disappointed by the Court's decision not to uphold this rule, which would bring many of the country's oldest and dirtiest power plants in line with modern standards and allow citizens to breathe cleaner, safer air. It is clear that the benefits to public health and the environment this rule would provide dwarf the costs of implementing it, no matter when in the determination those costs are considered. We hope EPA will work quickly to address the Court's concerns and issue a revised rule that implements these protections." Read the Supreme Court’s decision. 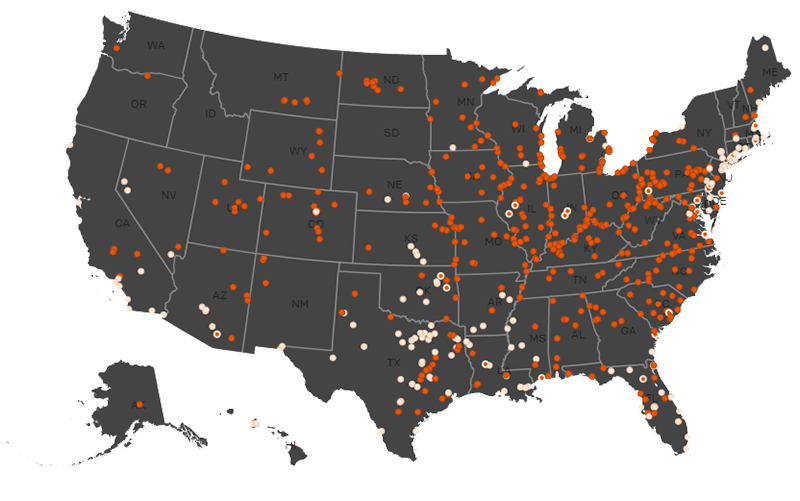 More than 580 power plants are likely covered by the Mercury & Air Toxics Standards. See where they are located.